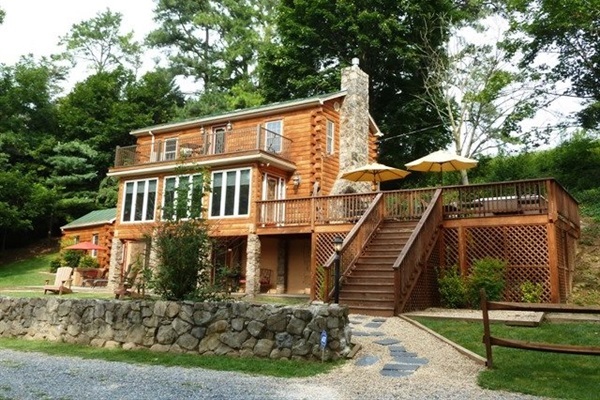 Serenity and Luxury await you at A Rustic River Cabin which sits directly on the Shenandoah River and will provide you with an unforgetable relaxing getaway! Come into this warm detailed cabin where you can sink down into the leather furniture in the living room by the gas fireplace and spend the entire day, or you can sit out on the enclosed Sun Room or the upper level Balcony to view and listen to the glistening water of the river. You can view the river and hear the water from all the windows in the Cabin to let your imagination run wild! Enjoy the many outdoor activities - fishing, swimming, canoeing, kayaking, and river tubes. The deck area off of the Sun Room provides an outdoor hot tub where you can look out over the river and mountains or stroll down to the firepit and roast some hot dogs and marshmallows, gas grill provided as well. Centrally located in the Shenandoah Valley for easy access to all the main attractions, 5 minutes to the entrance to Massanutten Resort, which is a "Four Seasons Resort (Indoor WaterPark, Golfing, Snow Sking and Tubing). Take some Winery Tours in the area, visit local antique shops and don't miss out on the Shenandoah National Park/Skyline Drive only 15 minutes to the Swift Run Entrance into the Park, and 25 minutes to the Luray Caverns. Other Fees: Quoted Price of $375 per Night is for 2 Paying Adults Only, extra Adults are $25.00 Per Person/Per Night, 1 Free Child Per Paying Adult is Free, Under Age 16. Accidental Damage Insurance (Covers up to $250) Processing Fee, Includes Cleaning $100.00 Per stay.